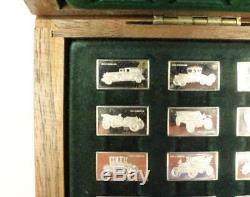 Centennial Car Silver Mini Ingot Collection Wooden Display Box Franklin Mint 925. 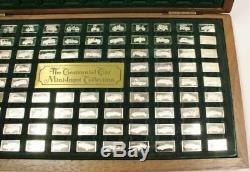 Complete Centennial Car Silver 100 Mini Ingot Collection Franklin Mint with Wooden Display Box. 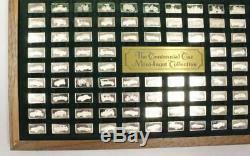 This Centennial Car Silver Mini ingot collection with deluxe display was officially released by the Franklin Mint. Each sterling ingot weighs 1.6 grams, totaling 160 grams of sterling silver. 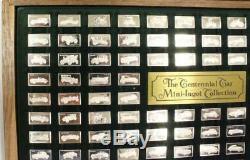 The full spread of 100 mini ingots depict automobiles through out history. For example, a 1885 Benz or a 1976 Volkswagen Jetta. Set includes brands like Austin, Cadillac, Daimler, Rolls Royce, Peugeot, Bentley, Porsche, BMW, Lamborghini, Renault, Bugatti, Duesenberg, Mercedes, Lincoln, Ferrari, Jaguar and Packard and more. The obverse shows an image of the model and year, the reverse shows the emblem of the auto maker. This is great memorabilia for any car collectors dream collection. Perfect gift giving idea for history or car fanatics. Set comes with 100 Sterling Silver Mini Ingots, Deluxe wooden display presentation box, Information booklet with detailed information of every vehicle featured in the set, outer sleeve, and How to care for and handle instructional mini ingot collection pamphlet as issued by the Franklin Mint. There are some minor scratches, fingerprints, blemishes on some of the ingots, one ingot in top left corner has some residue set is pre-owned and may have some wear, Please see images for condition. PLEASE DO NOT SEND US A MESSAGE STATING THIS, WE KNOW. All images are for the actual item being auctioned. Auctiva offers Free Image Hosting and Editing. The item "Centennial Car Silver Mini Ingot Collection Wooden Display Box Franklin Mint 925" is in sale since Tuesday, May 15, 2018. This item is in the category "Collectibles\Decorative Collectibles\Decorative Collectible Brands\Franklin Mint\Other Franklin Mint". The seller is "vancouvercoin" and is located in vancouver. This item can be shipped to Canada, United States, United Kingdom.